The real-time, digital enterprise is naturally modeled as events that occur throughout the enterprise and the actions taken in response to those events. Since the digital enterprise is conveniently modeled using events, it follows that event-driven systems are the most effective approach to supporting the digital transformation of the real-time, digital enterprise. 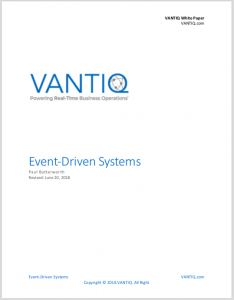 This white paper, by VANTIQ co-founder and CTO Paul Butterworth, describes the basic concepts of event-driven systems and applications.